The Guide To Mysterious Glasgow. Illustrated by the author and others. One of the most fascinating books ever published on Glasgow’s mysterious places, monuments and events, Geoff Holder's 'The Guide To Mysterious Glasgow'is the essential guide to everything strange, marvellous, mysterious and paranormal in Glasgow, with a street-by-street description of all things bizarre and supernatural connected with the city. 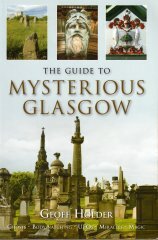 As well as a complete guide to all of the city's gargoyles, legends and relics, it includes tours of the Necropolis, the Cathedral, museums both famous and little-known, and Glasgow's hidden archaeological wonders. Many forgotten aspects of the city's murky history are also here, including pseudo-scientific. Marvels such as re-animation of a corpse in 1818 ('His chest immediately heaved! He drew breath! '), along with the 'man-monkeys' and leprechauns ('the only one ever captured alive') of the freakshows at the Britannia Music Hall. From the links between St Mungo, Merlin and werewolves to the urban legends of the Glasgow Underground, it will transform the way you experience the city. Containing more than 100 photographs and filled with countless tales of miracles, hauntings, cures, witchcraft, UFOs, big-cat sightings, vampires, murderers and bodysnatchers, The Guide To Mysterious Glasgow will delight residents and visitors alike. The team at glasgowsculpture.com congratulate Geoff on the publication of this fascinating book, and heartily recommend The Guide To Mysterious Glasgow to our visitors. Publication date: 22nd January, 2009.